Kari Berg is a versatile artist, ranging from electronic body music to opera. During her years in the music business she has done both solo-appearances, collaborations and appeared as part of bands. She is a mezzo-soprano who thinks about her voice the same way as theatre and modelling – Just as I portray different looks in photos, or play different characters in films, I also aim to use my voice in different ways, says Kari. In 2008 she joined the Swedish synth-pop band “Ashbury Heights” as the female part of the duo. They released the album “Take Cair Paramour” in July 2010 with positive reviews and ratings from 8,5/10 up to 10/10, followed by appearances at for example M’era Luna, Amphi and Belgium Gothic Festival. The band got a lot of praise throughout the years for their voices and their music, which has been called New Wave 2.0. The band disbanded in the end of 2010 and Kari turned to focus more on her solo project and collaborations. In November 2010 Kari announced that she joined forces with the Swedish Electro/EBM-act Chaos All Stars as one of the “All Stars”. The band have since then released several songs featuring Kari on vocals but also as a song-writer. The album “I Need It All” was released in February 2012 and “I Need It All – Addendum” was released in February 2013. Kari have been doing collaborations with other bands. In 2011 she appeared as guest star on albums by Ad Inferna, DE_TOT_COR and Psy’Aviah. 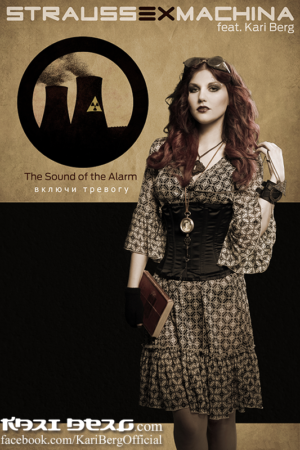 In August 2012 she released a song with Strauss Ex Machina called “Alarm” and in 2013 she released a song together with Jean-Marc Lederman (former Front242) called “Under The Light”. In 2012 Kari started to guest sing in the band Dark Side Cowboys, apart from several live performances she also appears on the albums “Chronicles” and “Chronicles III”. In 2016 Kari released the single “It’s Just Words”. In December the same year she release the EP “Music from Fjärilarnas stad”, a soundtrack from the book “Fjärilarnas stad” by Ingrid Remvall.